AUTHORITIES for the points brought forward can be found in the footnotes of the Parson's Handbook, and are therefore not here repeated. A few new notes and references are, however, added here, in order to cover more ground, and to increase the historical perspective. References are also given in the footnotes to a few easily accessible illustrations, which may be consulted in addition to those kindly drawn for this book by the Warham Guild. These latter cover, it is hoped, the main practical matters, and will in themselves serve to make this little book intelligible. THE linen Ornaments of the Church lawfully used within the Anglican Communion may be classed under four heads, of which the first is of very slight importance. III. 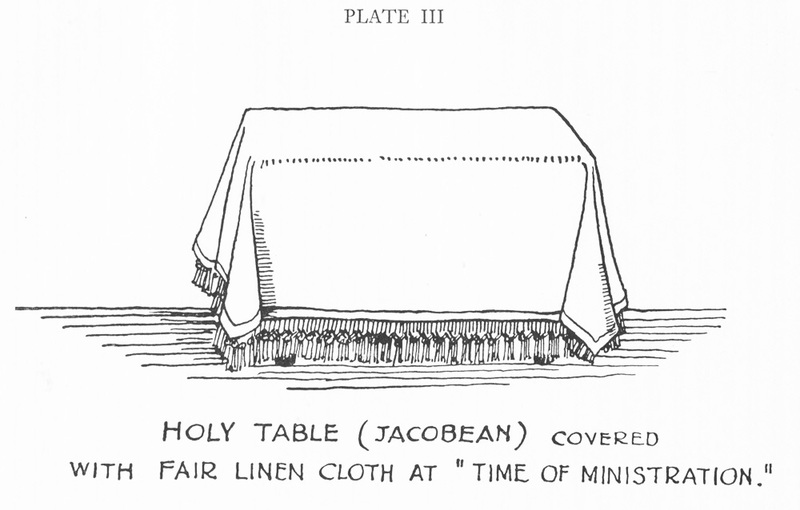 Linen for the Lord's Table. 1. The 'fair linen cloth at the time of the Ministration, as becometh that Table', of Canon 52. 2. Under this, the Undercloth. 3. Under this, the Frontlet Cloth. 4. A Coverlet, to protect whichever of the above is or are left permanently on the altar. IV. Linen for the Vessels. 1. The pair of Corporals, i.e. the Corporal proper, and the Pall or Second Corporal, which lies folded on the chalice until the Prayer of Consecration, and after the Communion is spread over what remains of the consecrated Elements. 2. The Purificator for wiping the vessels. 3. The Towel for washing the hands. 4. The Burse may here be included as in principle a linen envelope for the pair of Corporals, though it is stiffened and covered with silk or other material. Of little more than antiquarian interest are the houseling cloth and the font-cloth. The latter was almost entirely given up because fresh water was used for the Prayer Book service of baptism. [It was retained into the nineteenth century in five churches to my knowledge, where it hung over the cover like a pointed extinguisher.] The use of the former continued as a local custom in one or two places, and has been revived in recent times. Before the Reformation there were no communion rails, and houseling cloths or 'Easter towels' were [7/8] held by assistants under the hands of communicants as they knelt for their annual communion. 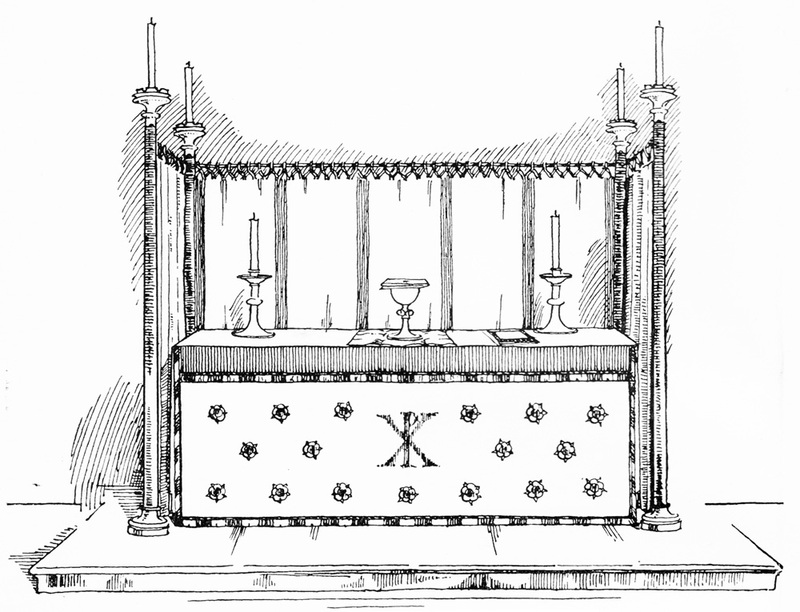 When they are used at the present day they are generally laid on the altar-rails; and, being mere strips of linen, there is nothing more to be said about them, except that they do not serve any practical purpose and have little or no aesthetic value, though they may perhaps act as a reminder that the primitive Eucharist was a sacred meal eaten round a table. We are concerned here only with the linen Ornaments of the Church. To another branch of the subject belong the linen Ornaments of the Ministers, such as the Surplice. But, for convenience, Veils may be mentioned in this place, since they fall between the two classes, and therefore might otherwise escape mention altogether. The Chrisom Cloth, formerly used in the Baptism of Infants, has long been obsolete, though for the Baptism of Adults by immersion (a rare but not unknown ministration in the Anglican communion) some kind of plain white gown is needed. The Confirmation Veil is a plain square of thin white linen, about 3 to 3 1/2 feet in dimension: it is generally worn with one corner turned back, and at the angles of this turned side there are two tapes for tying. The Churching Veil may be the same, but it is seldom used. The Lenten Array, however (see the Frontispiece), is of considerable importance, though little need be said of it in a book devoted to the more specialized uses of linen. Indeed, little can be done in cold print to show the extraordinary fitness and beauty of the Lenten white, or to supply ideas for the best decorative methods of treating it. It can be seen now in many churches, from Canterbury and Norwich cathedrals and Westminster Abbey downwards; and a good notion of the kind of materials required and of the possible lines of decoration can be obtained from a visit to the showroom of the Warham Guild. [72 Margaret Street, Oxford Circus, W. 1.] Without such visual evidence it is easy to go wrong. The sort of white linen used for sheets or surplices will not do; but stout, unbleached material or ivory-tinted diaper is required. The decoration requires some sense of design and indeed some knowledge of [8/9] architectural effect. A beginning can be made in a poor church, by the use of a plain St. George's cross (red on white) for covering pictures, &c. The colours and proportions of the St. George's white and red flag often form a good decorative arrangement, bright and faultless—but ordinary bunting is rather too bright, though it is cheap and easily washable: a rather deeper red than the colour of the flag is also preferable, but not essential. Frontals can be of toned diaper (or even brown holland) simply panelled with red (as is the dorsal in the frontispiece). The Dorsal can then be of the same material, without any decoration, but run on the rod so that it hangs in folds. The Frontlet can be of plain red linen, as in the Frontispiece. For Passiontide the Lenten array remains up; but a red Frontal is substituted: this may be of red linen or cotton diaper (or of serge) with narrow black panels; and the Frontlet may well be changed to black (of similar material) with a fringe of red, white, and black, or of two of these colours. Since it looks better for the fair linen not to hang over the front of the holy table, besides being cleaner as well as more in accordance with tradition, this cloth should be exactly the same width as the mensa, and with none of it hanging over the frontlet. It hangs better and has a more dignified appearance if it is rather long, so as to reach to within about six inches from the ground (see Frontispiece). [Illustrated in Plates 2, 24, 27, 28, 34, of the Parson's Handbook, 11th ed., 1928. Hierurgia Anglicana (for an example of 1668), 1903, Pt. II, Plate V. In the twelfth and thirteenth centuries the fair linen was spread in different ways, sometimes as here described, sometimes hanging all round the altar. The latter method is not so frequent in fourteenth- and fifteenth-century examples. See, e.g., those in Joseph Braun, Der christliche Altar, 1924.] It should be of good heavy linen, firmly hemmed; the hem along the sides may be 1 1/2 inches broad, and the ends will hang all the better if they are wider, say about 3 or 4 inches. The fair linen is generally marked for its special use by one, four, or five devices in white, red, or blue. These devices may be of any kind; crosses are easy to make, but not essential. According to later custom the fair linen should only be put [9/10] on the altar at the time of the Ministration (this was the English tradition before the Oxford Movement, it is also still the tradition in certain places abroad); though for convenience, when an altar is frequently used, it is often kept on it. [This is also the Eastern custom. In the West it was once the custom to keep the cloths on the altar out of service-time, as we learn from Gregory of Tours and other sources. From Isidore of Seville, Hrabanus Maurus, and others we learn that in the seventh century it was the custom to strip the altar of its cloths only from Maundy Thursday till Easter Even. According to Schmid and Doering, Der christliche Altar, 1928, it was still common in the twelfth and thirteenth centuries to keep altars covered except at this time.] In this latter case it should be washed once a month. If it is rolled on a roller and kept in a drawer, the expense of washing will be much reduced, especially in towns; but nothing should escape washing in Holy Week. The fair linen in this form is better not fringed. In the [10/12] more ordinary form it may be fringed at the ends, though this is not at all necessary. Such a fringe may be elaborate, and picked out in coloured thread. There is no authority for lace on any of the altar-cloths or on any other form of church linen. This second cloth, to which the frontlet (see the Frontispiece) is sewn, will naturally escape the rule of a minimum washing before Easter. It is protected by the fair linen and coverlet above, and by the undercloth below. Moreover, it is of a coarse linen to prevent slipping, and is better coloured—say darkish blue. It is made the exact length of the mensa. Its width will depend on the method of attachment. Where the modern fashion prevails of keeping two candlesticks and a cross permanently on the altar, little or no attachment will be necessary, and this cloth can therefore be of the same width as the mensa; but even in this case the addition of a broad hem (of about 4 or 5 inches), to fall over the back of the table, will help to increase its steadiness. On some modern altars there are round-headed screws on the top of the mensa, near the back. In such case this cloth will be the exact width of the mensa, and will be fitted either with eyelets or brass rings, or loops, to slip on the screwheads. This is a fairly convenient method. But perhaps the most effective and easiest method is to make the back hem broad and open, so that an iron rod (painted to prevent rust, scarlet being a good colour) can be slipped along the hem. The weight of this rod will keep everything in position. The third cloth is of medieval origin. [Durandus speaks of two cloths; but earlier writers mention only one. A Synod of Liége of 1287 says two at least, and so also does that of Cambrai of 1300 (which repeated the injunction in 1550). Two cloths are still taken for granted by Gabriel Biel at the end of the fifteenth century; and the minimum is still not more than two as late as 1584 in a Synod at Würzburg, and 1643 in one at Antwerp. But by the fifteenth century most authorities require three.] It may not be essential, but it has its use in protecting the two upper cloths from dust and damp, and in producing a surface at once soft and smooth for the fair linen. It is the exact size of the mensa, of white linen with a narrow hem (say, i inch), and of good stout quality if money permits. The best plan is to wash it once a quarter. 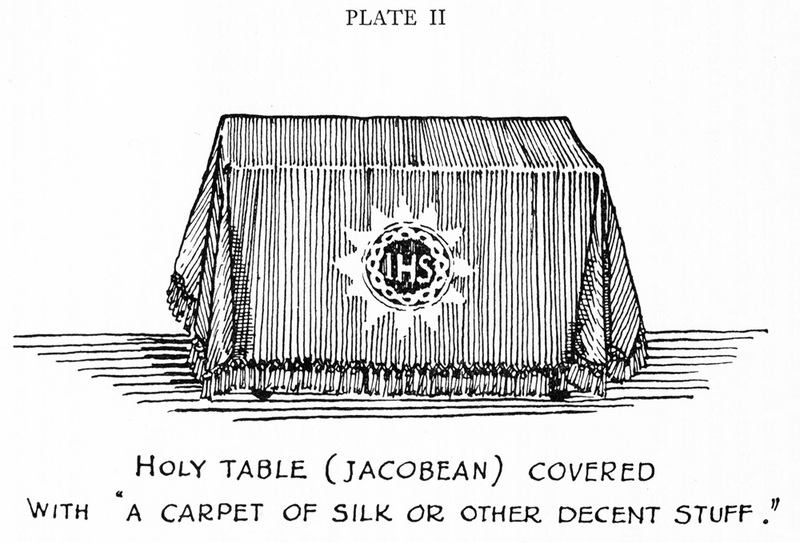 The Coverlet is used to protect the holy table from dust out of service time, whether the linen cloths are kept permanently on the table or not. It may be of a close coloured linen, or of plain silk of any colour, lined with coloured linen; or of some other material, lined with linen and bound with coloured ribbon. The coverlet is of the same width as the mensa, and affords rather more protection if it is two inches longer; but where the fair linen is kept on the table, an extra twelve inches will be useful to keep some of the dust off the ends of the fair linen. Or it may well be as long as the fair linen itself, if there are no riddels. It should be quite plain without any pattern or embroidery, and should not hang over the front edge of the altar. Nothing but clean linen should be used in connexion with the vessels. Unfortunately during the Victorian era several strange customs grew up, partly through sheer clumsiness and ignorance, and partly because the making of such things was delegated to amateur ladies who, not having to celebrate themselves, did not understand what was convenient to handle, and who were naturally influenced by the making of [14/16] secular garments for their own feminine purposes. Perhaps to some such causes must be attributed the invention of a cloth of thin lawn, edged with lace, which was supposed to be used after communion to cover the vessels. It is difficult to fold and put away, but it has survived in some places from the force of unreasoning habit. A piece of cardboard covered with lawn was used to cover the chalice and was called a pall. As this soon became stained and could not be washed, some ingenious person invented an arrangement of four pieces of elastic within which was inserted a piece of blotting-paper. This curious device also became very popular, and was taken over by the church-shops. If we remember that nothing except real stout linen ought to be used, the problem begins to simplify itself. If we study the Prayer Book, it becomes simpler still. A little knowledge of the history of the corporal makes it simple altogether. We then find that Church tradition requires a use that is altogether seemly, cleanly, and convenient. Originally there was one large corporal, which was laid on the holy table and turned over the vessels from the back. For convenience this was divided into two (as early as the time of St. Anselm); and we therefore have constant references in the old inventories to 'a pair of corporasses' or 'a pair of corporals'. [The inventories, of which many are published by the Alcuin Club, are full of examples of the pair of corporals. As late as the eighth and ninth centuries the piles of small rolls and the large cups took up a great deal of room, and required a very large corporal. In Ordo Romanus I, c. 770, the corporal is as large as the top of the altar, and two deacons spread it (one throwing the end to the other) just as we spread an ordinary table-cloth at the present day: see Atchley's edition, p. 60. So also in the Fifth Ordo: the Sixth Ordo mentions that the corporal shall be 'of such size as to cover the whole surface of the altar'. A Synod of Coyac, 1050, says, 'Both under and over the chalice there shall lie a complete corporal, of linen and clean'. Durandus, c. 12 80, however, describes the corporal as 'double': the one the deacon spreads on the altar, the other he lays folded on the chalice. In a Synod of Bayeux 1300, the distinction between the pall and the corporal is already clearly made, though the older use continued in some places. It was frequently ordered that the pall should be of the same perfectly plain linen as the corporal, and ornament of gold thread, pearls, or lace was forbidden. When all have communicated, the Minister shall return to the Lord's Table, and reverently place upon it what remaineth of the consecrated Elements, covering the same with a fair linen cloth. This is the second of the pair of corporals. For convenience we call it the pall. It represents that part of the ancient large corporal which was brought over the vessels from the back. When the large corporal was divided into a pair, this second part was and is used as a separate covering for the chalice and for convenience is folded. After the communion it is unfolded and used, according to very ancient custom, as a covering for both species of the now consecrated Elements. There are therefore two corporals, and nothing else (see Frontispiece and Plate IV). These corporals are of plain stout linen, and are alike, though it is convenient to distinguish them by embroidered marks. They are: (1) the first corporal, The Corporal; (2) the second corporal, The Pall. THE CORPORAL (Plate IV, A, B) should be of smooth, stiff linen, of a size to lie conveniently upon the altar—for no part of it should hang over the front. A convenient size is 20 inches for both corporals. It is often slightly stiffened with starch; and this, though not the ancient custom, is convenient. This is the cloth that is spread upon the altar, and on which the chalice and paten are set (Plate IV, B). To distinguish it from the pall it is called simply the corporal, and is generally marked in a special way, most conveniently by one cross, or other symbol, in the middle of one side (Plate IV, B). The corporal should always be folded in the same way into six parts. First the front side is folded over the middle part; then the back is folded over these; then the right side of this strip is folded over the middle; and lastly the left side is folded over the rest, leaving a small square, as in the illustration, Plate IV, A. 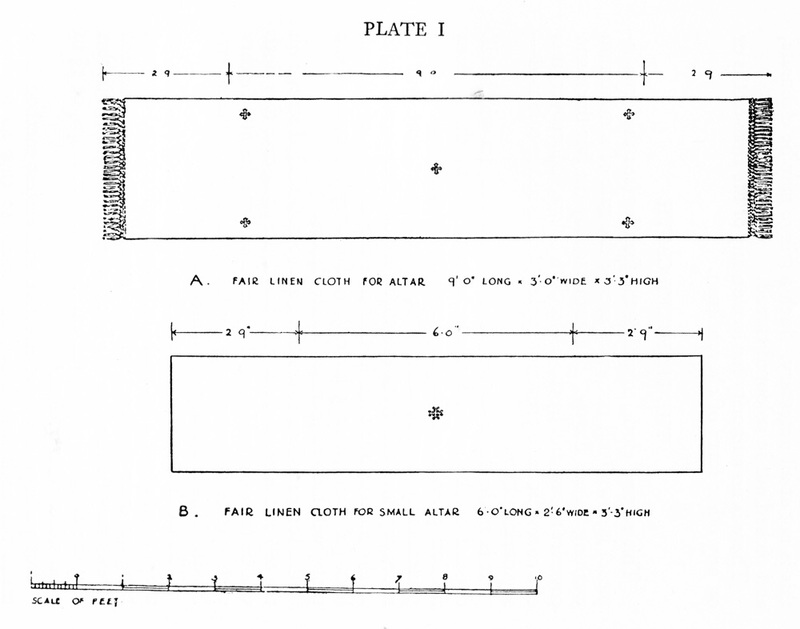 THE PALL, or Second Corporal (Plate IV, C, D) is exactly the same as the First Corporal, though its use is different, and to show this distinction it may be differently marked. Such a mark is one cross (which may be larger than that on the first corporal) or other symbol, exactly in the middle and [17/18] on the smooth side of the linen; so that, when it is folded, this symbol is outside and in the middle of the small square, as in Plate IV, C.
All embroidery of this sort may be in white or coloured thread. Some prefer to distinguish the pall by the use of coloured thread, while the corporal is marked in white thread only. But this is a matter of choice. The pall is folded like the corporal. 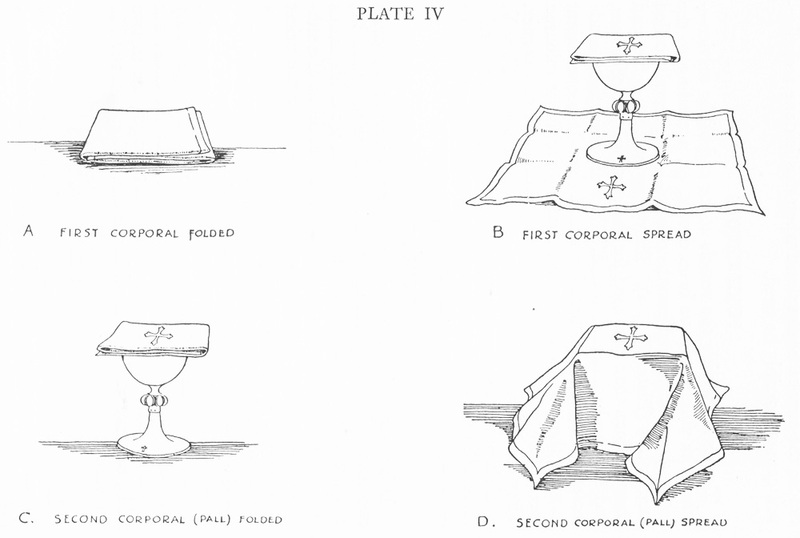 It is used as a cover for the chalice until after the communion, as in Plate IV, C; and then it is spread open, as in Plate IV, D.
The corporal and pall are kept folded in the burse (see Frontispiece), a flat case of any material (but lined with linen), large enough to hold them easily. There is no reason why the burse should be of the same colour or material as the vestments, though it generally is so made nowadays. A contrast of colour looks very well, and it is more convenient to have only a few burses in use, since every such burse should have always in it the corporal and pall. In small churches, the use of one burse only may thus be a real convenience. A good size for the burse is from 8 to 10 inches square. The upper side may have any suitable design on it, or it may be plain. The lower side may be of the same or of different colour and materials. Some stiffening of board or buckram is generally found convenient, and an edging of cord or braid. Small tassels are occasionally added at the corners. The two parts are sewn together, hinge-wise, at one side, but the other three sides are not joined. It will be noticed that the only veiling of the vessels by the priest is the veiling with the spread corporal after the communion. There is no Anglican authority for silk chalice veils, which were of late origin and were introduced into this country in the Victorian era. They became popular because they supplied (with coloured stoles) an opportunity of using liturgical colours in churches where coloured vestments were not worn. They are clumsy things to handle; and the priests who have discarded them can testify to the relief which comes when the vessels can be handled without a silk veil which drags at the paten and requires to be arranged and rearranged. There is no doubt that the Lincoln Judgement of [19/20] Archbishop Benson is right in directing the chalice to be prepared before the service begins; and when this is done a chalice-veil cannot possibly be used. 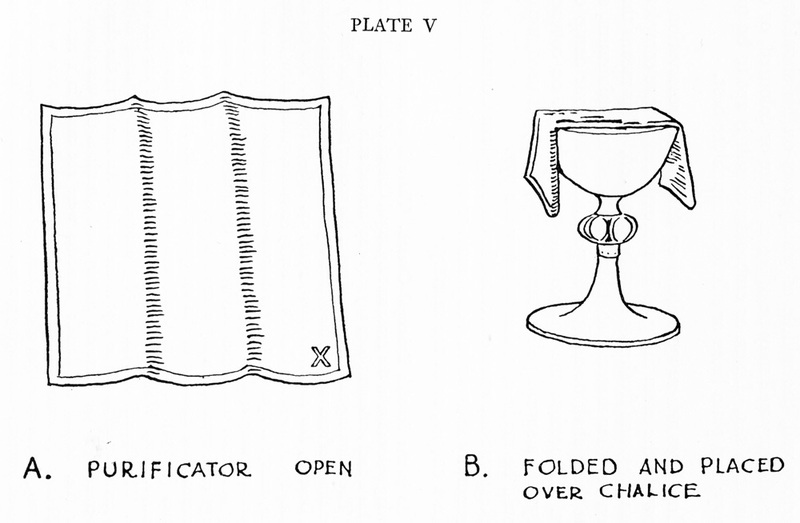 Towels for wiping the vessels at the end of the service—when the ablutions have been drunk, or, according to the earlier practice, poured into the piscina—are generally called purificators (Plate V, A, B). They may be of a softer and cheaper linen than that used for the corporals, or of diaper, and may be hemmed all round. They are sometimes made too small: 13 inches square is a useful size. It is convenient to mark them with a quite small device (of white or coloured thread), or with the initials of the church, in one corner. They can be ironed into a strip of three folds as in Plate V. If six purificators are provided with every pair of corporals, there will probably be enough in stock to provide a clean one for every celebration of the Holy Communion. 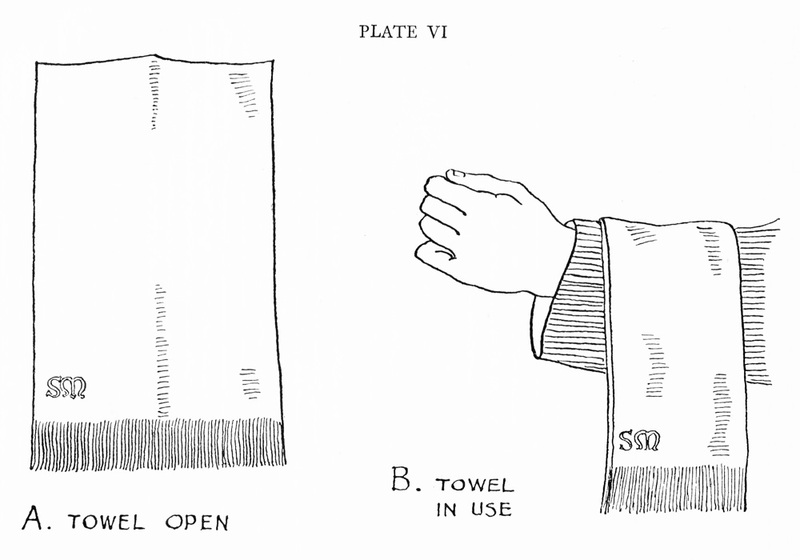 It is a good plan to provide with every pair of corporals two towels for the priest to dry his hands with (Plate VI, A, B), and for the deacon also if he needs to wash his hands after communicating the people. Towels should be of a substantial diaper and large enough for real use (for the priest should really wash his hands and not merely make believe by the use of a few drops only of water). They should be long enough to hang on the clerk's arm (Plate VI, B)—say 3 1/2 feet by some 10 to 15 inches wide (12 perhaps as a standard). Towels are generally not marked, nor are they generally hemmed, but pulled into a natural fringe at the ends: but this is indifferent. They may be folded lengthwise in two folds, or three; and the towel in use can be kept on a rail in the vestry. Before the service, a towel is placed on the credence. In the vestry a purificator is laid between the chalice and paten, the pall is laid folded on the paten; and on this is placed the burse containing the corporal. After service, the purificator is placed inside the chalice, and the folded pall and corporal are put into the burse. The [20/21] chalice and paten are carried out by the priest with the burse upon them. But when a clerk carries them he may use the long offertory veil, the middle of which rests on his shoulders. The offertory veil may be of linen, white or coloured, or of plain thin silk. Linen or embroidered silk is apt to be too heavy; and plain linen or silk looks much the best. In places where occasional or continuous reservation is allowed, the main thing to be remembered is that complete cleanliness and freshness must be obtained. [As in the Scottish Episcopal Church. There is no rubric or canon allowing reservation in the Protestant Episcopal Church of the United States, nor has a final settlement been as yet (1929) arrived at in England.] This means that linen or other material should be reduced to a minimum, so that there shall be as little as possible to harbour damp or dirt. Therefore the chalice and paten should be covered only with a spread pall in the aumbry; if a pyx is used, a pall should be made of a size to cover the pyx. Reservation, when conceded in the Anglican Communion, is generally allowed in a cupboard or aumbry in the chancel, or in a chapel, or in the sacristy. [The following notes may be of use at the present time. The history of the manners of reservation in the Middle Ages is concisely described in Schmid and Doering, Der christliche Altar, 1928, pp. 146-9, 190-6. For the first thousand years the Alcuin Club Collection by Freestone, quoted below, is better. Justin, martyr c. 150, says that the deacons communicated the sick as well as the ordinary congregation. People reserved in their own homes (in an area) as early as c. 200: this custom survived in the fifth century and even later. Clergy often wore habitually a small bag round their necks to carry the Sacrament, and instances of this are quoted from St. Hilary (c. 350), St. Birinus (c. 630). Giraldus Cambrensis notes the practice among Celtic priests, c. 1200. While this custom obtained, communion of the sick was easy. The Council of Macon (585) ordered that what remained of the consecrated bread should be kept in the sacristy. An aumbry in the chancel was common in the thirteenth century, and sometimes this was above the altar (i.e. behind the dorsal: aumbries were not made in a reredos). Archbishop Peckham ordered aumbries, c. 1280; but his rule was not observed, for the suspension of the Sacrament above the altar continued to be the usual practice: this hanging pyx was often in the form of a dove in France and elsewhere (but rarely a dove in England) from the twelfth to the sixteenth century. There are many examples of the aumbry between the thirteenth and sixteenth centuries; and a Council at Ravenna in 1311 orders that the Sacrament be kept, sure and hidden, in the church or in the sacristy, 'so that no sacrilegious or woman's hand of any sort have access to it'! In Germany the aumbry developed into the Sakramentshäuschen, generally in the north side the chancel, which sometimes had a spire reaching almost to the roof: the oldest is in St. Severin, Cologne, 1378; there are sixteenth-century examples, and some also in France and Belgium. The Papacy now forbids them, but allows a few exceptions—at Frankfurt, Mainz, and elsewhere. An early example of a tabernacle on the middle of the altar comes from a Synod at Narbonne, 1509. The tabernacle spread throughout Italy in the sixteenth century, but did not become common in Germany till the seventeenth. Gradually it replaced the earlier customs in all Roman Catholic countries, but the hanging pyx survived through the eighteenth century, and the aumbry continued in many places to be used into the nineteenth. In the Scottish Episcopal Church, an aumbry on the north side of the chancel has always been used. The aumbry should be plain and smooth inside, so that it can be easily rubbed over once a week with a cloth. A wooden lining for the aumbry is best. On the floor of this small cupboard a square of perfectly plain white linen, hemmed, will prevent any jarring of the vessels. No furniture beyond this is desirable. Since everything ought to be fresh and clean, the tradition that nothing but washable material lies on the altar (except a protecting coverlet) should be maintained. Velvet on the mensa is undesirable for this reason. The drawers in which linen is kept may be well washed in Holy Week, or on a summer day; and they should be in a dry place. Musty or dusty smells being thus avoided, the sweetness of the drawers may be increased by the use of lavender. Fixed rules for washing should be observed; and, in towns at least, it may be well to regard the following as a minimum: (1) Fair linen once a month, if it is kept permanently on the holy table or often used. (2) Undercloth once a quarter. (3) Corporals, if in regular use, once a month. (4) Purificators every Monday. It is a good plan to have all the linen clean on the Principal Feasts. The Lord's table should be stripped entirely after the Holy Communion on Maundy Thursday, washed, and well cleaned, and then left to air till it is dusted and vested on Easter Even. It is well to strip, dust, and air the altar (and any minor altars) again on a bright day in August or September. Linen may be washed in warm water with lux or white soap. Wax can be removed by ironing with a hot iron over the spot covered with blotting-paper; grease or dirt with a flannel moistened with petrol or benzine. Ink stains when recent can be moved by milk before washing; when more obstinate, by lemon juice mixed with salt, or by salts of lemon; wine stains by holding the part in boiling water. Linen is the traditional material simply because cotton is a tropical and sub-tropical product which was not ordinarily available for the inhabitants of cooler regions where the [25/26] linum or flax is easily cultivated. [Linen is mentioned very early, e.g. by Eucharius of Lyons in 449. St. Chrysostom, however, speaks in a sermon of 'cloths worked with gold', and a 'purple covering of the altar' is mentioned in the records of the Council of Constantinople of 536. In the early medieval period silk was sometimes used on festivals; but (e.g.) the Synod of Coyac, 1050, orders linen, and Ivo of Chartres and Durandus both mention that the linen was white. Silk and gold-work continued sometimes, e.g. in an inventory of Notre-Dame, Paris, 1431, 'Une paule de soie blanche royée d’or . . . laquelle sert au grand autel par manière de nape à la parer aux festes solempnelles'. But white linen was the general rule.] Now that cotton is so largely used as the result of many inventions in a more developed civilization, it would be pedantic to condemn its use in church: still, what is for us the more costly as well as the more ancient material is generally the more suitable by virtue of its smoothness, fineness, and strength of texture. In the Eastern Churches, the linen of the ancient tunica talaris was not retained, as it has been with us, for the albe and surplice, but was replaced by silk, and the same process has there taken place with altar-linen. But silk is not so clean and fresh for such purposes as linen or cotton. With the abundant use of lace in the secular costume of the seventeenth century, the fashion arose of attaching lace also to the ornaments of the Church. This fashion was, however, almost confined to the Roman Communion; and when lace ceased to be worn by men, towards the end of the eighteenth century, its use began to have an undesirable suggestion. It also mars crispness of outline and that swing and folding of material which is known in art as drapery. Silk and lace are therefore excluded from our range of materials as substitutes for or additions to the linen ornaments of the Church. They are outside the Anglican tradition, and are also outside that ancient tradition common to the whole Church upon which the wisdom of the English Reformation was based. Some medieval developments the Church of England pronounced to be mistaken, and modern knowledge is vindicating this judgement to-day: those that were not blameworthy she continued to require by her rubrics and canons. The rubrics have been again agreed upon, revised, and confirmed for the Church of England in the New Prayer Book of 1927-8, which, though not at present promulgated, will, one may expect, form the basis of episcopal administration; and the Ornaments Rubric remains the law of the land. The other Churches of the Anglican Communion share the same ceremonial rules, without which indeed the unity of the Anglican Communion would disintegrate. For the externals of public worship are among the most powerful of forces in holding men together in a common loyalty. Even in comparatively small things this principle is valid; and, from small to great, logic will make its way.